Monofilament fishing lines known to most as “mono fishing lines” are still today one of the most popular types of fishing line. Mono lines are easy to handle and have the give and take to keep your hook firmly set in a fish's mouth. 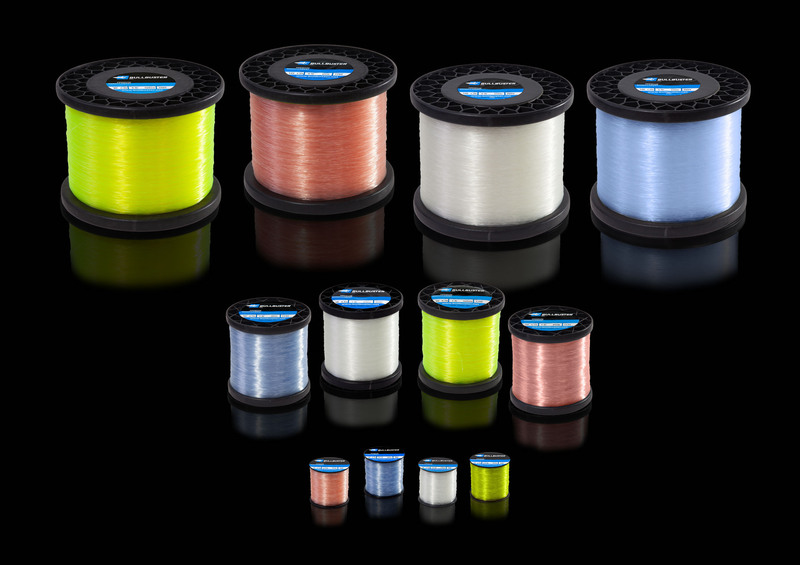 Our monofilament lines have great casting, low memory and , have extreme tensile strength to diameter ratios. + What Mono Do You Need & How Much Do You Need? Register your reels with us so that we can help recommend you lines, or try our braided backing and mono topshot calculators to do it yourself. We are ready to help you spend more time on the water with our brand direct monofilament lines. + Why Mono Is Awesome? Our monofilament has high stretch and low memory. This means it has give and take to let you fight a fish without getting jerked around or tearing a bigger hole in the fish’s mouth and when the pressure releases the line goes back to its original form with little to no trace that it ever stretched. While mono does absorb some water it usually remains neutrally buoyant, meaning that it is great for working topwater lures or not messing up the action of any number of lures that have different sinking rates. Monofilament is pretty old technology so the methodology of making it has been perfected over time to make you a high quality product at a very affordable cost. Our monofilament is made by combining pellets of several different polymers that are extruded, stretched, and cooled at at optimal levels to bring you a line that catches fish and is simply badass. Our mono is designed to not only be easy to tie knots but to hold the strength of those knots when it is needed most. If you want any advice on how to tie knots take a look at our articles on knots. Many people fill their whole reel with monofilament for trolling. The reason for this is monofilament has the give needed for hooking big fish while the boat is still moving forward. Also most people scale their reels to the size fish they are targeting so there is not always a reason to add braided backing. Very few serious fishermen use anything other than mono for kite fishing. Our monofilament has the abrasion resistance needed to go in and out of kite clips all day and is subtle enough to handle as you pick up or drop your kite lines to keep your baits in the zone or take them away from unwanted bites. Mono is definitely more abrasion resistant than braid around sharp objects. This is simply because of its larger diameter. Having a couple chunks cut out of our mono by sharp structure under pressure is not always an issue, whereas braid is not forgiving around anything sharp. If you are looking to fill a reel up for general fishing, monofilament line is the way to go. Braid has been dubbed the new “superline” but mono has been catching fish since the 50’s and there is a reason it is still around (It works!). When using monofilament be sure to check rinse it off after every use and change it after it begins to have some wear and tear or has had too much sunlight. When you fill your reel completely with braid there is very little give and take. Adding a monofilament or “mono” topshot can give you some give and take and act as a shock absorber for the tremendous amount of force that comes with a large fishes mass pulling against you at high speeds and with extreme acceleration. This can stop a big fish from jerking you around like a ragdoll and it can also reduce the movement of the hook in the fish’s mouth making it less likely to create a bigger hole in the fish’s mouth which often results in the hook pulling. We strongly reccomend a monofilament topshot for land-based shark fishing. We also reccomend only kayaking your baits out to expose your monofilament to the water and use your braid as your secret backup. Monofilament line is a hell of a lot more abrasion resistant than braid. When fishing for sharks from the beach, there is often a lot of structure to provide abrasion against your line. There is always something, it can be the reef, rocks, crab pots, and even the constant grinding of the sand against your line. For this reason it is always good to have a fresh mono topshot. This topshot should be replaced on a regular basis as the elements their toll on the line. There are also lots of toothy criters out there such as blacktips, and blue fish that may cut you off. Getting cut off with mono will put a much smaller dent in your wallet. If you are a serious shark fisherman looking to break records and win tournaments, you should be replacing your topshot after every several trips or every BIG shark. This is especially true for any line not originally designed for land-based shark fishing like Bullbuster monofilament. Monofilament or “mono” lines are great for big game fishing as top shots because they are easy to handle and have give. We know that lots of you use just in case braided backing to turn small reels in to beast slaying machines. It is always good to have a monofilament topshot to work with for rapid rig changing, easy handling, and give and take. + Are You Trying To Get Your Baits Deep? + Do You Need Sensitivity To Feel The Bite? + Do You Need Invisible Line? Monofilament for the most part is pretty translucent underwater, but there are certain situations where you need invisible. If you are fishing extremely clear water, if the bite has shut off, if your target species has excellent eyesight, then head over to our fluorocarbon page.